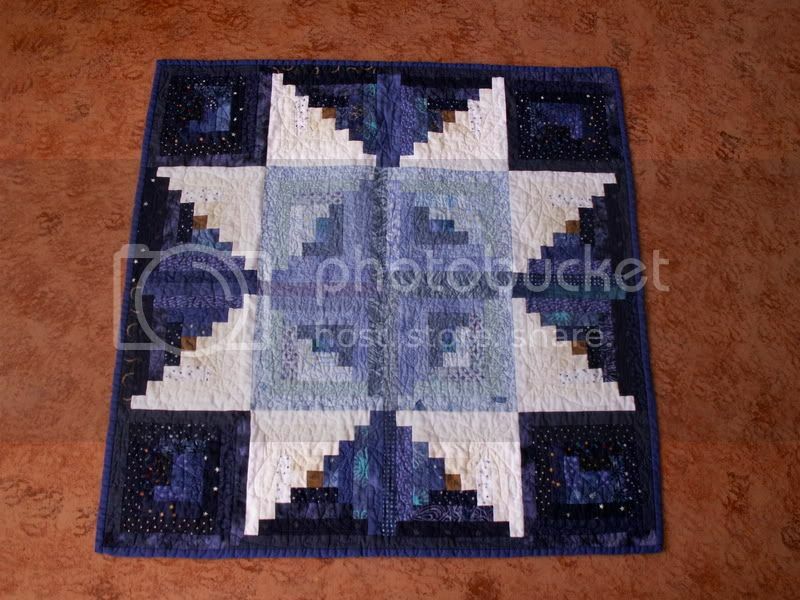 I made this quilt for amaryllisroze in the IYP 11 swap. 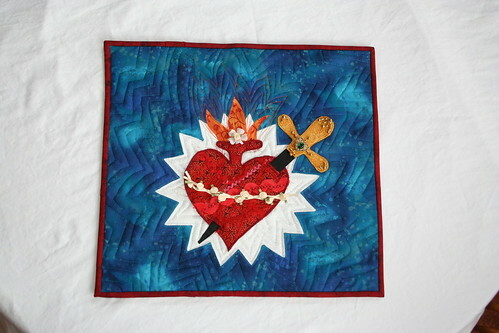 I've made several sacred heart quilts but aroze challenged me to make one in the "immaculate" heart style with the knife going through it. I enjoyed the challenge. 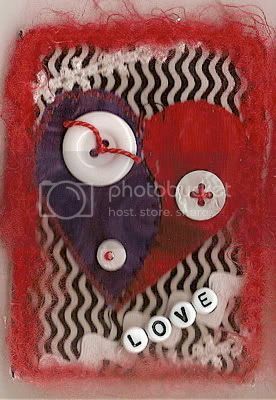 The heart is several red fabrics and trims sewn to red wool felt and could stand alone as its own mini quilt. The knife is sticking through some buttonholes. I made it out of heavy peltex so it would be sturdy. I think it is around 14 x 16 but aroze would have to measure since I forgot to do that. My friend wants a carrier for her crockpot kind of like the casserole carriers people make from fabric. Any ideas or pattern suggestions? I made this for the lovely batgirl in the IYP swap. 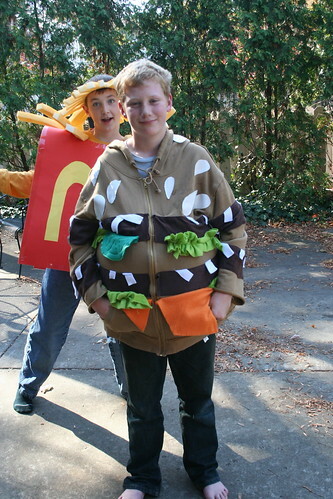 My son, who happens to be named Mac, wanted to go as a Big Mac. 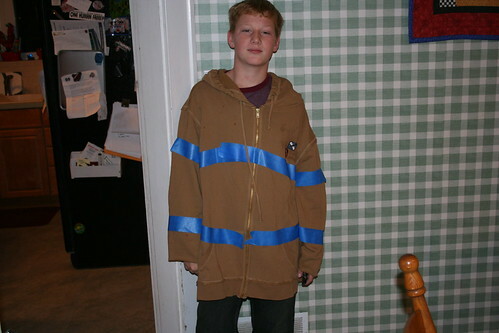 I decided to make his costume out of a purchased zip front hoodie. My friend made her son's french fry costume to match! Two all beef patties, special sauce, lettuce, cheese, pickles, onion on a sesame seed bun. (I didn't add the "special sauce" because it was 3 am and I didn't want it to get all over him and everyone else at school the next day. When people asked where the sauce was he told them that was "private". Ha ha. I love 12 year olds! 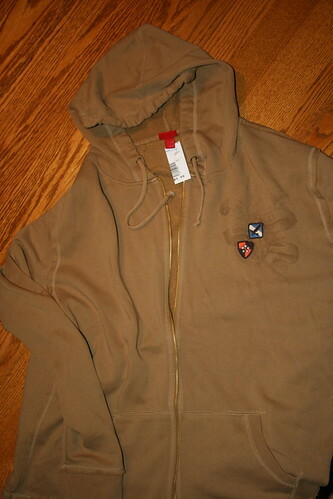 Start with a hoodie the color of the bun $9.99. I love a bargain. Tape where you want the burger patties to go with arms down so they match. 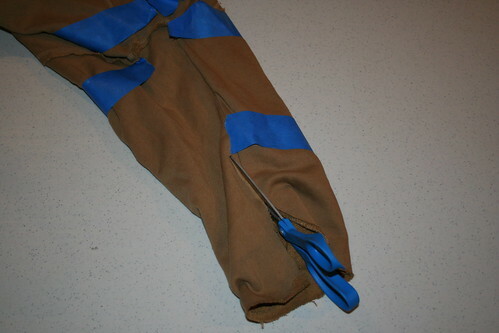 I cut brown stretchy suede in 4 /12 strips and stitched polyester fleece strips to it to make the onions. Then I sewed them about where the tape strips are. I turned them under. I recommend just stitching close to the edge and not being so picky if you are in a time crunch. I also took green fleece for the lettuce. Cut a big strip, gather it, cut it in pieces and place it strategically around the patties. sew it down. Pickles: Take darker green fleece. I cut circles out of freezer paper, ironed it (low setting, don't melt your fleece!) to the fleece and stitched around in a close zig zag satin stitch. Then I sewed the triangles in the center to make a pickle shape. 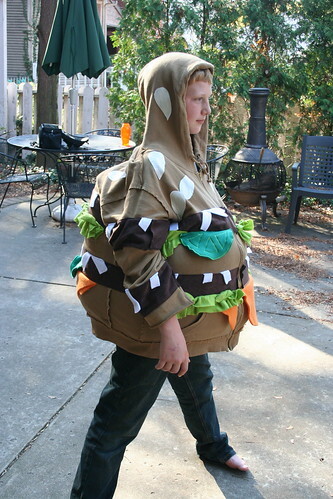 Cut in pieces and sew to the burgers. Take orange fleece for the cheese. Cut big triangles. I stitched two layers together and stitched it down. Sew the sleeves back together. If you aren't lazy, sew the cuffs back on where you cut them off the sleeves because they are too long. I'm lazy. Pin pillow forms in the front and back with safety pins to make the burger fat. There you have it! 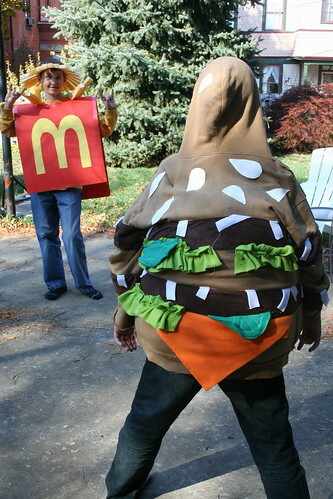 A Big Mac Costume ala Gingerquilts. 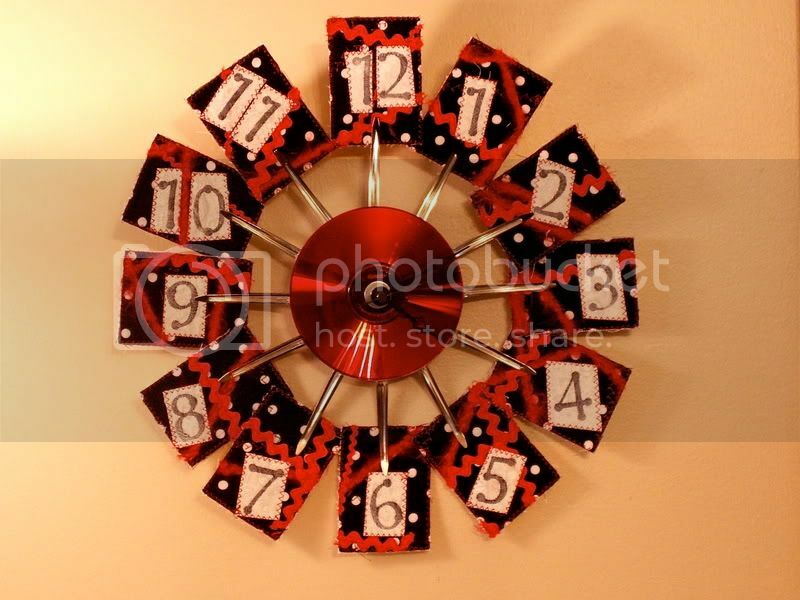 The clock is made using a red CD, a clock parts kit and hair clips from the beauty store that I glued carefully onto the back with gorilla glue. The tags, or numbers, were really like a quilted fabric atc that I made as tags for each of the 12 gifts. You could use the clips to hold all kinds of things. I posted this because I'm getting ready to make one for each of my daughters. 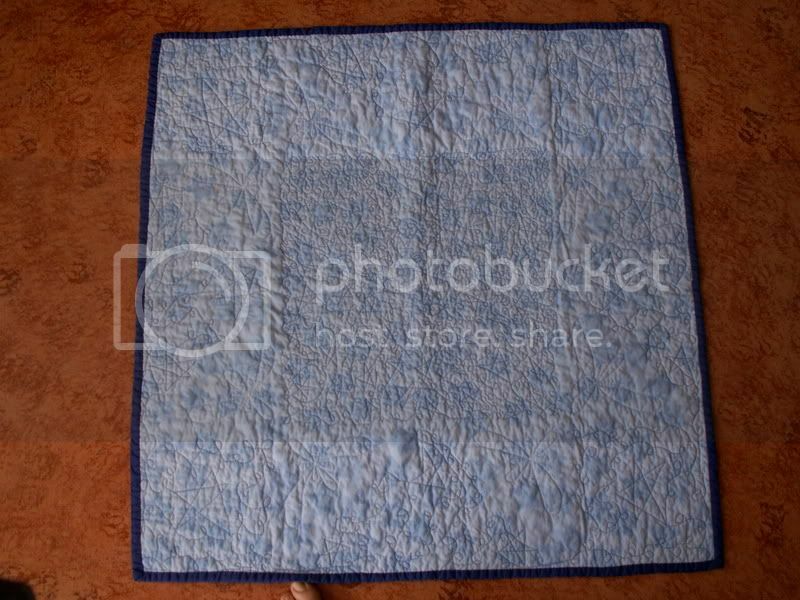 I washed it after quilting to give it that old time quilty pucker. The back is flannel. It's about 36" by 36". The "logs" are all 1 1'2 inch strips before they were sewn together. Yarn (I used thick red yarn I got at Walmart) 2 skeins was enough. I took control top pantyhose and put them on my head to guess the size needed. Cut off the legs and turn it inside out. Sew the opening shut. It should kind of gather up as you do this. My seam was about 1/2 inch. You can trim it if you wish. This is the base of the wig. Next I took a 26 quart trashcan and wound the yarn around it from top to bottom. I did this three times for the entire wig. Once I got from one edge of the trashcan with the yarn I laid a ribbon down the center of the trash can and hand basted the ribbon under the yarn down the middle with large stitches. I caught about 4 strands of yarn in each stitch, then I came back the other way and went over the stitches the opposite way so all the strands of yarn were caught on the ribbon. I then cut the strands down the middle along the bottom of the trash can and carefully carried it to the sewing machine. I ended up tying each yarn "half" with loose yarn like two pony tails. I sewed the ribbon along the basted edge to the middle of the pantyhose cap (along the center seam) leaving about an inch at the top where the bangs go. Your stitched edge is your part and you have your two "pony tails" one each side. You have to be careful not to catch the wrong parts of the cap in your stitches. You could probably hand sew this, too. Anyway, I carefully carried it back to the trash can and did this a total of three times. I left a little ribbon tail at the end and ended the last of the ribbon by tucking it under the back edge of the cap and catching it in the stitches as I stitched the "part" to the cap. I put the cap on and braided each half until I was satisfied with the length. 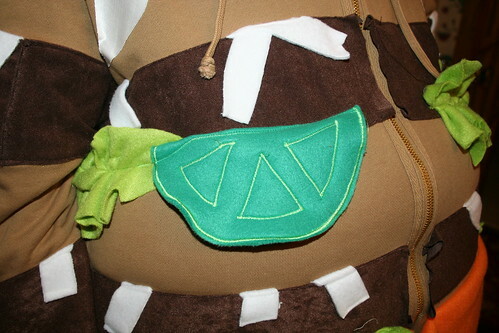 The ends of each braid are tied tightly with yarn and then a ribbon that matches the costume. I made the bangs by wrapping yarn around a book. I cut the yarn in half, sewed a ribbon down the middle and then flipped the yarn over and sewed it again, so it was doubled. The top fringe of the bangs is then a little shorter than the bottom of the fringe. Leave a long ribbon tail on each side of the bangs to help attach it to the cap. I tried on the cap, pinned the middle of the "bangs" piece to the center of the cap and stitched one spot the width of the ribbon to the center front of the cap to anchor it. Then I tried it on again and pinned where I needed to stitch the ends of the ribbon tails (kind of tucked up and under the the yarn near the part). Then you give yourself a yarn hair cut until you achieve the look you want. To put it on you kind of need to stretch and pull the cap and the braids into place. You tuck your hair in and can play around with adjusting the cap until you are satisfied with the fit. We kind of yank the braids down and forward to help adjust it. My daughter is going to wear a little raggedy ann type cap over the top so bare spots on the cap won't really show much. You could make your cap out of red spandex or red tights or make your yarn thicker if you didn't want it to show much. Anyway, there you have it! Go make one and post a picture! 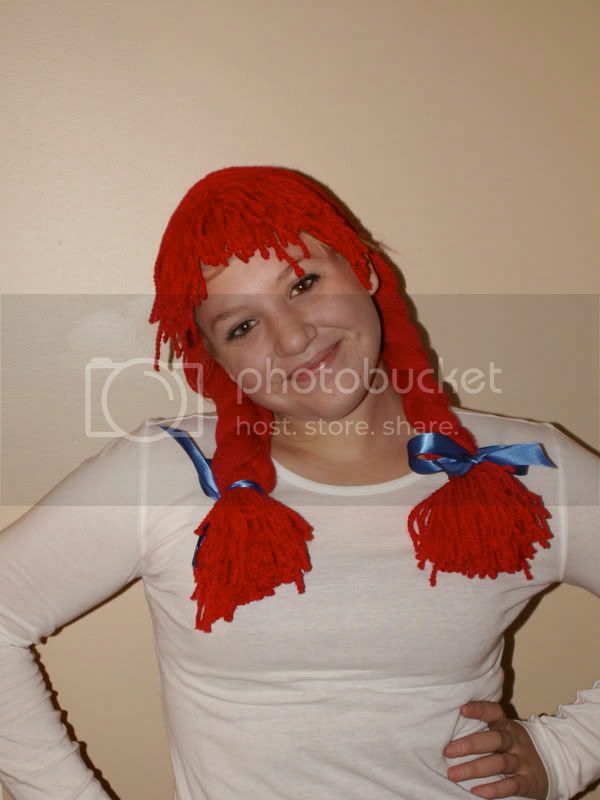 You could be Wendy, or even Pippi Longstocking with this new do. I used the great tutorial by queenofdiy to make my bag for the challenge. 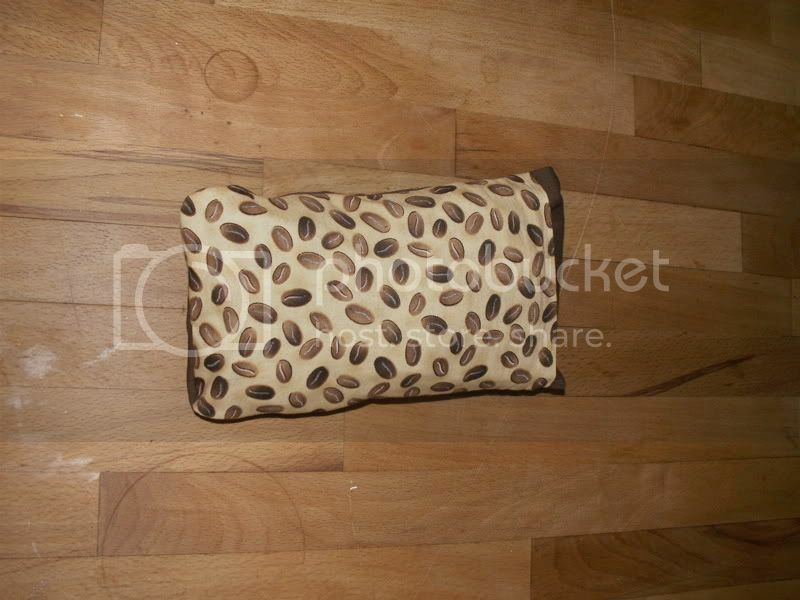 I used brown canvas and lined it with a cute coffee bean fabric I have been hording. 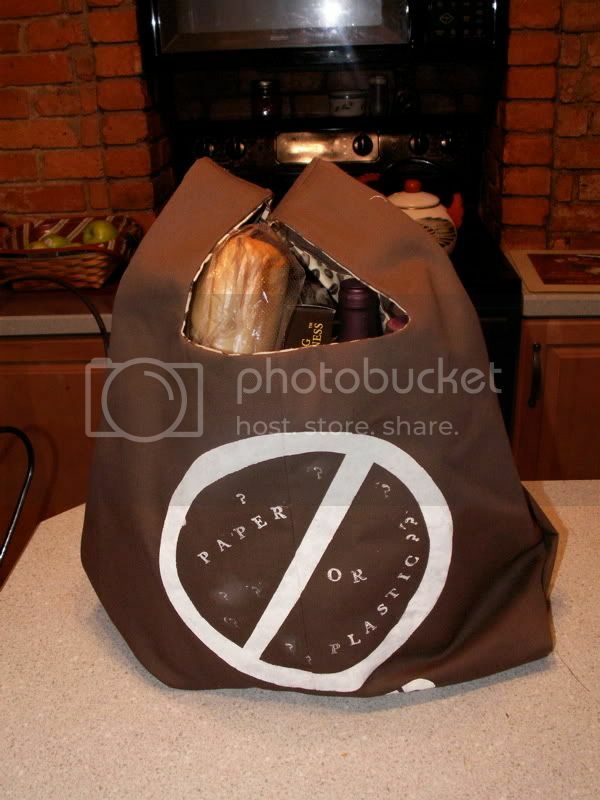 I stencilled "paper or plastic ? 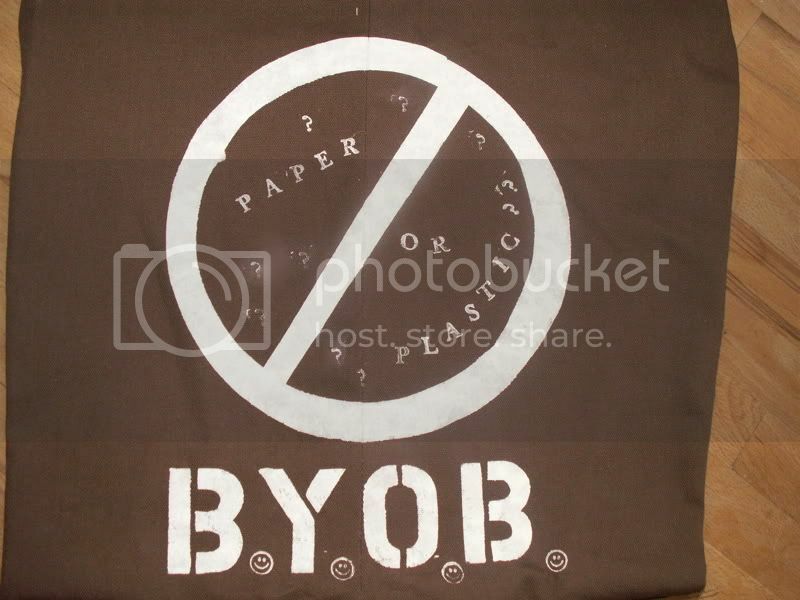 and then stencilled over it with the "no" symbol. Folded into its little pocket. I should have made that pocket wider to accomodate the thick fabric! I'm hoping to go through my stash of fabrics to make a bunch more. 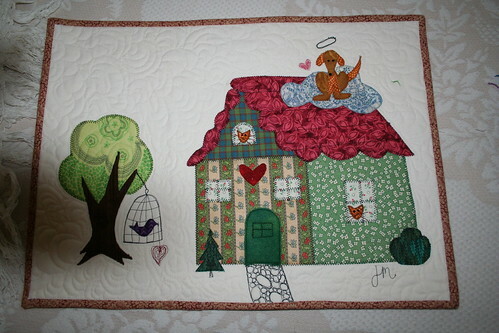 Here is my quilted version for the February "amore" challenge. 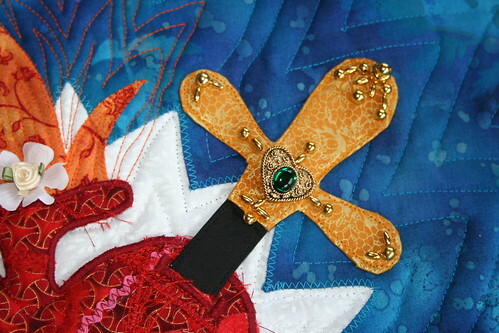 The little heart is stitched up and held together with thread, buttons and beads. I actually did a series of three of these little mini quiltlets for the valentine ATC swap.